SEIAN Genshin started studying the shakuhachi in Tokyo with the head of the Kanto Branch of the Tozan shakuhachi style, KATO Seizan. In 1973 he changed his affiliation to study with Ryoan KOIZUMI Shizan, the 38th of Myōanji for one year, and then continued in Kagawa Prefecture with Fuan YOSHIMURA Soshin, the 40th, and studied with him for the next 25 years until his death. SEIAN became a Myōan teacher in 1976 and has since been teaching upcoming students. 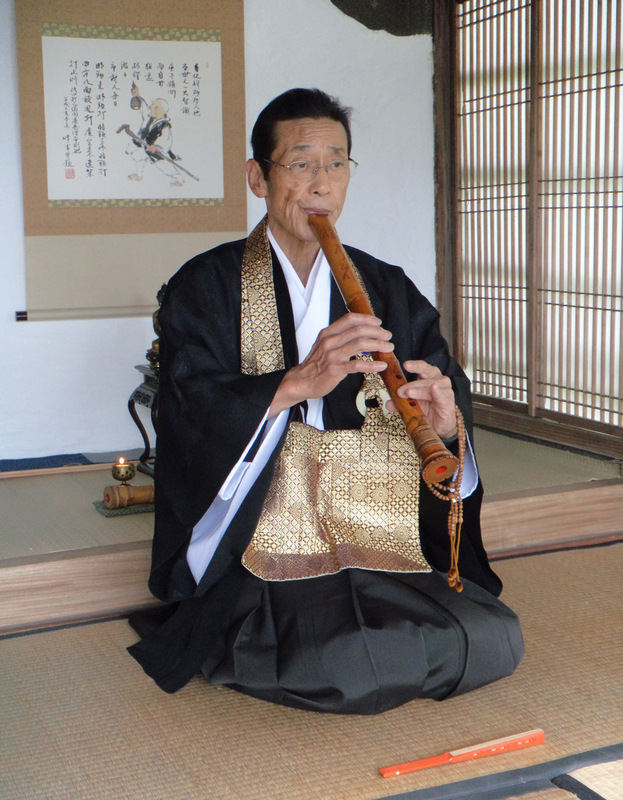 He has been playing shakuhachi for 48 years. Currently the 42nd kansu (director) and head of the board of directors) of the Seishu Fuke Kyoreizan Myōan Temple. He is currently carrying out the organisation and instruction of Fuke style Myōan shakuhachi, including performing throughout Japan at Fuke shakuhachi donational performances. Participating in WSF2012 Kyoto with the ‘Myōan Distant Cry of Deer’ group. He currently teaches in Kyoto, Osaka, Hiroshima, Takamatsu and Kochi. He has published Fuan Yoshimura Soushin, the 40th Bochiku-kai’s ‘Forgotten Bamboo—the Heart of Myōan shakuhachi’, and published the 2015 DVD Myōan shakuhachi honkyoku collection ‘Suizan—Blow, don’t Blow!, Cry, don’t Cry!’ and the 2016 CD Myōanji’s ‘Complete Collection of Soshin’s Performances: The World of Fuan YOSHIMURA Soushin’.